Once you've identified your ghastly nocturnal visitors as true Trick'r'treaters, the next question is what on earth to feed them. Here we have compiled a useful list of the traditional Halloween foods from various parts of the British Isles. We suspect the modern trick'r'treater may be expecting candy, but that's a modern affectation that you don't have to pander to! At the risk of ungratefulness from your mini recipients, here are some healthier (and in many cases tastier) alternatives to foil-wrapped chocolate. Traditionally Halloween food is based on all that leftover pumpkin flesh. 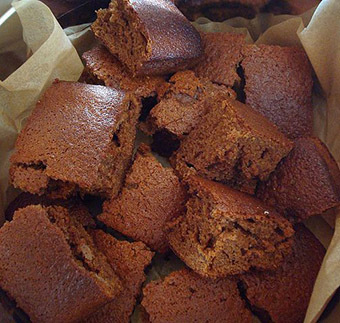 There are many delicious pumpkin recipes in the world, and indeed we have a rather good pumpkin pie recipe on Daily Info. But it was not always so. In the olden days (before our culture borrowed so heavily from USA, land of the pumpkin, there were other foodstuffs associated with the three days of Allhallowtide (All Hallow's Eve / Hallowe'en - 31st Oct, All Saints' / Hallows' Day - 1st Nov, and All Souls' Day - 2nd Nov). At this time of year the veil between this world and the next is thinnest, and all sorts of strange mischief might happen. It's safest to be in disguise, so no saint or soul recognises you, hence the whole business of dressing up and scaring the scary things right back into the grave. And offering them tasty treats will obviously appease the malign influences who might be lurking. Halloween itself was the vigil before the festival days got started (like Christmas Eve) and so it was a day of fasting ie the food that day was supposed to be vegetarian. Some of the most popular come from Ireland, though Allhallowtide isn't an especially Catholic festival. Perhaps the Irish just know the best veg recipes. These include Boxty and Colcannon. The traditional recipe combines raw grated potato, leftover mashed potato and flour. These are mixed with milk, baking powder and egg. 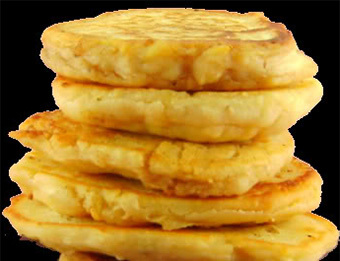 It makes a small but thick griddle cake, like a dropscone, which is fried on both sides and eaten slathered with butter. Or the mix can be made thinner in which case the shape is more like a crepe. Then it can be used as a wrap. You can flavour the mix with garlic or spices. If you're not feeling strictly vegetarian you can eat it with bacon and maple syrup. 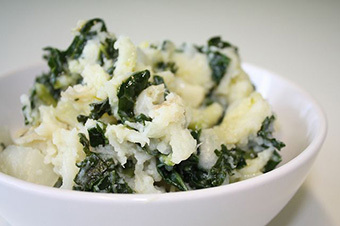 Colcannon is a wonderfully green-streaked mix of mashed potato and kale or cabbage, traditionally made with leftovers, but good enough to bother making mash specially. The mash can be made richly with milk, cream or butter or more spartanly with a bit of olive oil, but either way should be well seasoned with salt and pepper (taste it to check!). You can mix in onion or leek, if you wish. Colcannon can be eaten as a mush, or mashed and then baked to give a crispy top, or shaped into little cakes and fried. It is extremely good with ham, which seems to be a theme with these recipes! For decadence you can make a well in the top and serve it with a pool of melted butter in there. A delicious modern version involves some carrot and swede cooked with the potato and mashed together, with olive oil, making the colour even richer. While cooking the root veg you can steam the cabbage leaves whole above it. Sweetheart cabbage is particularly good, and can then be snipped in, cutting the leaves using scissors. An old Irish custom is to serve Halloween Colcannon with charms in, usually a ring and a thimble, and maybe some coins too. The ring says you'll be married within the year; the thimble that you'll die unwed. What the coin symbolises is unclear, though it might well be a trip to the dentist, as coins in fluffy mash are surely a recipe for disaster. Please good missus, a soul cake. & three for Him who made us all. Take flower & sugar & nutmeg & cloves & mace & sweet butter & sack & a little ale barme, beat your spice, & put in your butter & your sack, cold, then work it well all together, & make it in little cakes, & so bake them, if you will you may put in some saffron into them and fruit. Ale barme is a yeasty mixture made of flour and ale, so it's beer yeast that's used for rising this mix. It has to sit and prove for a while before baking. The fruit is probably raisins or currants rather than a whole soft fruit embedded. You should mark the top with a cross to show they're alms ie to give to the poor. On the 31st some cakes were left out for the dead (with wine, rather like Father Christmas's mince pie), and on 1st Nov the trick'r'treaters (or soulers) would come around to ask for theirs. 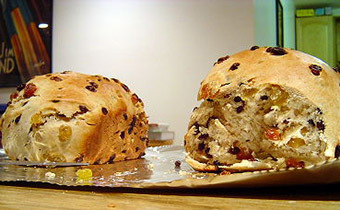 These days perhaps this tradition has become Barmbrack, a sort of fruity tea bread, which has charms baked into it, like a more complicated version of the Colcannon charms. They are a pea, a stick, a piece of cloth, a small coin (eg. a silver sixpence) and a ring. The ring means you will marry this year, the pea that you won't marry, the stick that you'll marry unhappily and argue; the cloth that you'll be poor, the coin that you'll be rich. Not a wholly positive set of fortunes. The Portuguese version is Pão de Deus - a soft briochey roll topped with coconut and sugar, with a slightly macaroony texture. So good it's no longer confined to Halloween, and has become a breakfast staple, often eaten with ham (spot the theme...). 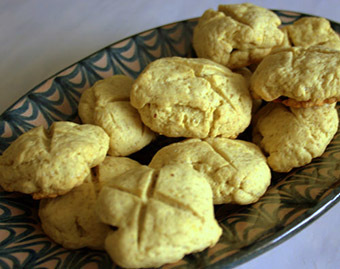 There are many recipes online, for homesick Portuguese. Being apple season, a number of Halloween options involve this tasty fruit, not least Cider drinking (only for older trick'r'treaters, obvs) and apple bobbing. 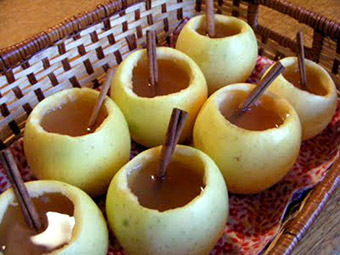 Apple bobbing in cider would of course be the logical conclusion and has surely been tried in many student houses, leading to a year of sticky carpets. 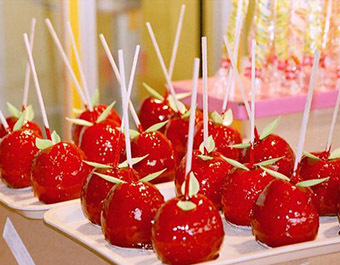 Now a staple of fairs, toffee apples are apples with a coating of hard crackly toffe, made from sugar syrup that is heated to a hard toffee temperature. This consist of sugar, water, cinnamon, and red food dye. According to the Australians the best apples to coat are Granny Smiths. Personally I think these are a bad idea, as the coating makes apples taste really sour, and the toffee is invariably too hard and falls off when it cracks. A straw poll in the office reveals no-one likes toffee apples, though everyone for different reasons. They might be nicer as slices, or indeed in a different form, as in their Chinese cousins, Tanghulu. 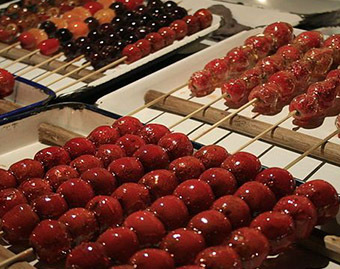 Using smaller fruit than toffee apples means multiple fruit (eg three) are threaded on one skewer, and coated in a similar sugar syrup mix giving a bobbly appearance. Traditionally the fruit would be Chinese hawthorn, but other options include cherry tomatoes, mandarin oranges, strawberries, blueberries, pineapples, kiwis, bananas, or grapes. Presumably the kiwi fruit are peeled first, and pineapples sliced. If you can't be bothered to make sugar syrup, you can just dip fruit in sugar and blowtorch it. Sugar reappears in the Bonfire foods, required at much the same time of year - including treacle toffee (like a dark Harrogate toffee, eaten in lumps), cinder or honeycomb toffee (has holes in, like the centre of Crunchie bars), and parkin (a cross between cake, toffee and flapjack, made with oatmeal). 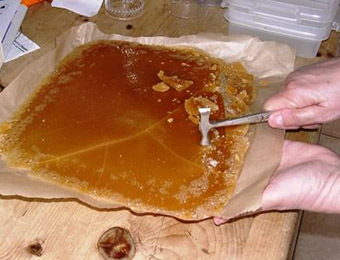 All toffees are fun to cook, but require a sugar thermometer and, often, a toffee hammer to break the result into bitesize pieces. The dangerous nature of hot sugar syrup mean making toffee is not a very family friendly activity. Though the eating of toffee certainly is. Whatever you choose to make (or buy!) for your trick'r'treaters we hope you have a lovely Halloween, and that all your fortunes are good ones.